Between Dec. 14 and 16, 2018, the third Farma Valley Winter Fest was held in Southern Tuscany, in four hamlets halfway between Siena and Grosseto (Piloni, Torniella, Scalvaia, and Tatti). 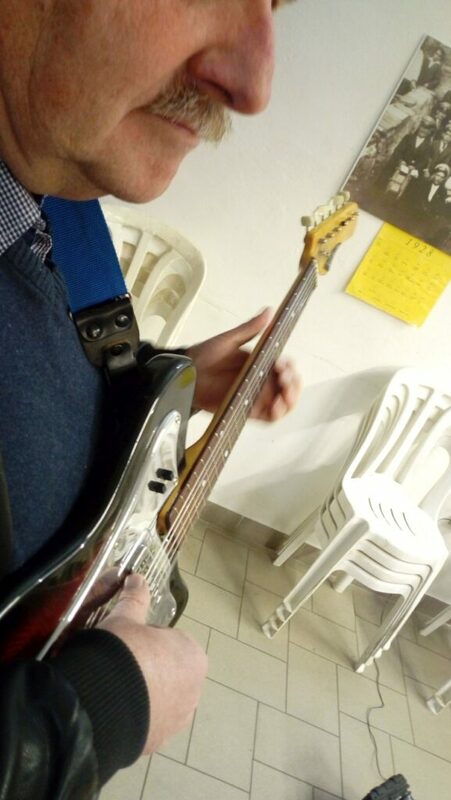 The motto for the initiative was “three days of pici, love, and music”, recalling the Woodstock festival and a typical pasta from Southern Tuscany. The festival was launched in 2016 as an original way to animate a scarcely populated area (some 400 residents in 120 square kilometres) which in the Winter months is essentially seen as a wild boar hunting ground (which is ok, but may be integrated by other ideas). The festival is raising increasing interest, and in 2018 it saw the addition of a new location out of the valley: the village of Tatti, which in fact is related to it as it is just by the Farma creek springs. On Saturday, Feb. 23, at Hotel Lombardi in Florence, via Fiume 8, the organizers of the Winter Fest, collaborating with some subjects from the Florence area, will propose an adaptation of the mid-December event, tailoring it to the size of a budget hotel close to the Santa Maria Novella railway station, and fitting to an eight-hour schedule the program which in the Farma Valley was proposed in three days. Attendance is free, but to you need to register in advance by sending an e-mail to info@pibinko.org or calling +393317539228 by Feb. 20, 2019. During the event it will be possible to review the pibinko.org network activities held in 2018, and to brainstorm on new projects being developed for 2019, especially in relation to the Metalliferous Hills Jug Band and PORGEP 2019. We can do this in Italian (if you speak it or would like to improve it), English, French, Portuguese, and Spanish (for a start). vintage moustache for vintage guitars. Coming to the Florence event will enable you to (1) help compose the free/open source community maps of the Farma Valley and Tatti, (2) play “panforte”, (3) see the rendering of prehistoric Sardinian monuments, (4) dance some twist, (5) try to rock-made nutcrackers, (6) learn more about prehistoric quarries, medieval iron works, protected and non-protected species; (7) get acquainted with night sky promotion and protection initiatives where rural bartenders are co-authors with senior researchers in international publications; (8) use ancient carpenter tools, (9) listen to some badass riff played with a vintage Eko guitas (or play it directly, if willing and able). But, most of all(10) try to play with the ball of an ancient game, forbidden by Florentine laws in the 13th century, but still routinely played in our home locations. …this is just to mention the main attractions which will be presented. 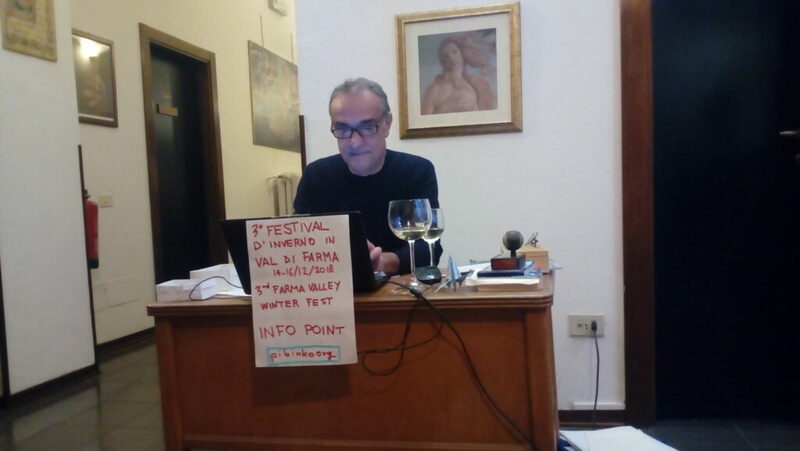 If you then browse the News section for pibinko.org, you may review what happened at the last Winter Fest and get an idea of what may occur in Florence in a few days. For this we are redirecting you to the Italian version of the pibinko.org site, since things were spinning so fast that we could not handle the real-time translation of our material: http://www.pibinko.org/tag/fdi-vdf/ and you can then switch to the English version again. How will all this fit in a 25-square metre breakfast hall and one single room? This is our part of the business. You can start by saving the date: “Florence, via Fiume 8” for Feb. 23. We are working on the hours of the event in the meantime. The core happening will be between 6 and 8PM. You should expect to find an exhibition and some information material starting early PM. Next Monday we expect to issue a more detailed schedule. The Farma Valley Winter Fest in Florence is an idea by pibinko.org in collaboration with Hotel Lombardi, and various partners…a full list will be provided at the end of the event since it is in a very lively state during the preparations. The Feb. 23 event also reconnects to a preview of the festival given in the same location on Nov 15, 2018 (article in Italian, with photos).